Trust Mister Sweeper to remove litter and trash from your property with expert precision and professionalism. We have performed regular power sweepings at thousands of parking lots, parking garages, sidewalks and other exterior sites. Our goal is to leave an overall litter-free appearance. Power sweeping cleans litter, dirt and rubbish from your property using state-of-the-art sweeping equipment mounted on customized trucks. Our own SideKick Turbine Blower System (US Patent) can blow litter off sidewalks and sweep parking lots simultaneously for optimum efficiency. Sweep curb-lines, corners and other areas where trash tends to accumulate. “Patrol” sweep open parking lots and driveways, picking up trash where it has fallen. Clean the sidewalks with our SideKick turbine blower or by hand. Manually touch-up corners with a hand blower or broom and dustpan. 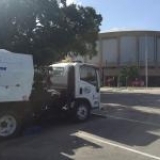 Mister Sweeper also provides several other exterior maintenance services. If you're in our Dallas/Ft. 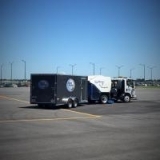 Worth or Houston market areas, we encourage you to give us a call today to see why Mister Sweeper is one of the top sweeping companies in America!